In his disappointing new modern-dress production of Hamlet, director Austin Pendleton has given up the ghost. Literally. We never see (or hear from) the ghost of our hero’s late father, the one supposedly murdered by his brother, Claudius. It’s the first of many unusual and unfortunate choices in this sluggish, ill-conceived new revival, which runs through May 10 at the Classic Stage Company and features Peter Sarsgaard as the coke-snorting Dane with serious daddy issues. Perhaps we are meant to think that Hamlet is mad from the outset, answering the call of disembodied voices that cannot be independently verified — except that his buddy Horatio (Austin Jones) and the guards at Elsinore vouch for the ghost’s existence. In any case, we don’t learn the ghost’s message — that he was killed by his brother, Claudius (Harris Yulin), to claim both the throne and the queen, Gertrude (Penelope Allen) — until the play-within-a-play commissioned by Hamlet to “catch the conscience of the king” late in the first act. An attempt to build suspense? To make us question Hamlet’s already shaky judgment? Who knows? 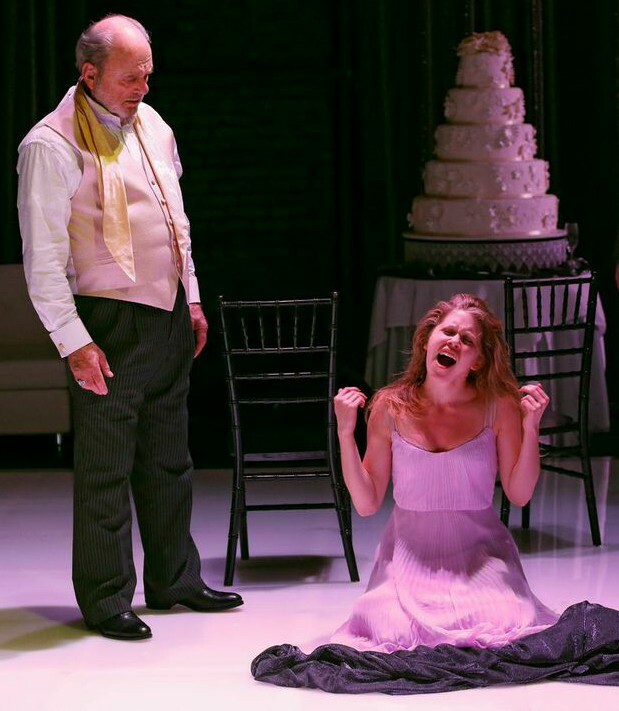 As with Walt Spangler’s set design — which suggests an all-white wedding reception complete with dance floor, leatherette banquettes, and a five-tiered cake — I’m at a loss to explain this production’s interpretive spin on one of Shakespeare’s most popular tragedies.